« Make Your Landscape Beautiful This Spring! After a long winter, your lawnmower should be ready to go. Spring is almost here. Next week, we’ll see the official beginning of spring. Even if your landscape and lawn have been suffering the effects of rain, cold, and wind, you can still revive it. Here are some helpful tips for landscape care as spring settles in! After a long winter, your lawnmower should be ready to go. Make sure you have enough oil and gas for it, and inspect it to make sure not parts are rusting or broken. A lawnmower that has been left in the cold will need some time to warm up, too. 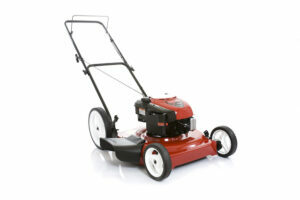 You can take advantage of late winter and early spring sunshine by setting your lawnmower out in it. You can also put a black trash bag over the mower to encourage heat collection. Weeds are never fun to deal with, but if you want your front lawn and backyard landscape to thrive, you’ll need to get rid of them. If you’ve seen crabgrass growing, then you can use special commercial products intended to limit its spread. But if you plan on planting something this spring, you might want to avoid using weed killer. While getting rid of weeds is important, don’t forget to feed your grass and help it wake up after sleeping all winter. You can make the roots stronger before you start mowing because the grass might still be vulnerable due to the effects of frost. Whatever fertilizer you choose to use, don’t forget to look at the instructions and follow them as carefully as possible. Mulching season is on the way. However, before you go ahead with this, you might want to wait. Holding out for consistently warmer temperatures will help the mulch work better. The best part of mulch, besides adding some character to your landscape and lawn, is that it can discourage weed growth while protecting whatever you’re looking to plant this season. This entry was posted on Friday, March 16th, 2018	at 6:01 pm	and is filed under Landscaping Maintenance	. You can follow any responses to this entry through the RSS 2.0	feed. Both comments and pings are currently closed.